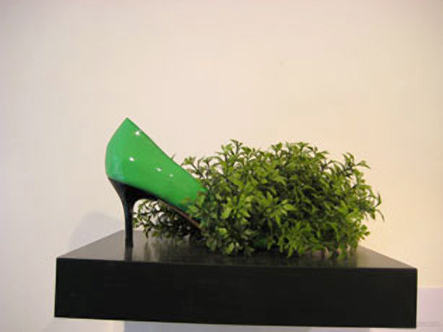 jaggedart is delighted to present ado: artists doing objects where artists have been invited to create an object with a practical use, where beauty and practicality converge. 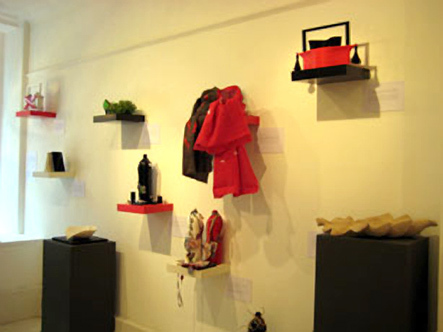 The objects presented at the exhibition are ideal for Christmas presents. 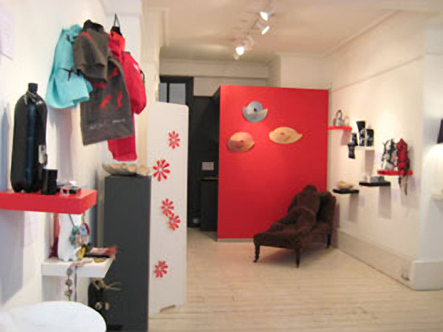 They will range from tableware and jewellery to small scale furniture and clothing, or any object with a practical use. Julia Farrer trained at the Slade School of Fine Art in 1972 and became a Harkness Fellow at the University of New Mexico and New York, 1974-76. In 2007 she was the winner of the Kaupthing Singer & Friedlander/Sunday Times watercolour competition. Julia has exhibited extensively and amongst others, her works are included in the collections of the Tate Gallery, London; The Arts Council; of Great Britain; Ashmolean Museum, Oxford; The Metropolitan Museum of Art, New York; Victoria and Albert Museum, London; Yale Center for British Art, CT, USA; Government Art Collection, London; The British Museum, London. Her works, whether prints, books or paintings are linked by a common interest in geometric form. They explore the illusion of space and volume. All of her compositions have pristine surfaces and immaculate edges and exploit the ambiguities that result from representing a three-dimensional figure on a flat surface. 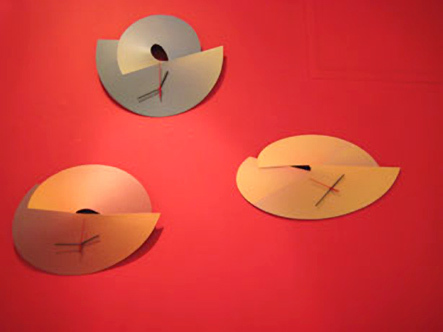 For ADO Julia has added to space and volume, the dimension of time in her geometric clocks. Liliane Lijn studied Archeology at the Sorbonne and Art History at the Ecole du Louvre in Paris. She works in a broad range of materials and media, making extensive use of new technologies to create works that view the world as energy. A constant dialogue between opposites, her sculptures use light and motion to transform themselves from solid to void, opaque to transparent, formal to organic. In all her work the unifying thread is her interest in the relationship between the material and the immaterial: body /mind, matter/energy, darkness/light. 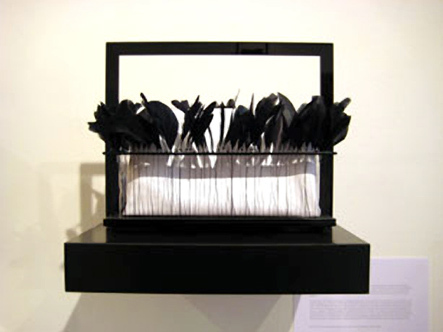 Her practice takes inspiration from science, oriental and western philosophies and the archetypal images of mythology. She is particularly interested in the interaction between light and matter. In her recent work, she uses video as memory encapsulated in light. 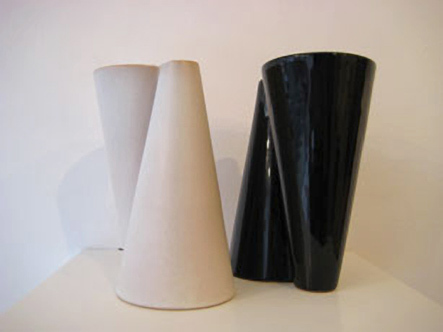 Conical forms have been part of Liliane Lijn's work since the sixties when she was inspired by the striped cones which act as signals on the roads which crisscross our planet. The cone, as symbol of the 'sacred mountain', has been the basic architectural form for places of worship throughout Asia and the Indian subcontinent. Her work is in major collections in this country and abroad including the Tate, Victoria & Albert Museum and the Art Institute of Chicago. Recent sculptures have been commissioned for Central Milton Keynes, Birchwood Science Park in Warrington, University of Warwick and East Anglia, St Mary's Hospital on the Isle of Wight and St Thomas' Hospital in London. Gabriella Ingram did a Foundation Course at Bath Academy of Art followed by a BA Hons in Theatre Design at Wimbledon School of Art. Gabriella has designed a huge diversity of shows from Renaissance and Baroque dance to TV commercials. She has designed operas at Holland Park, The Almeida, The South Bank and Chateaux in France. She has also worked at the Royal Opera House, ENO and the Globe. In her works she uses found objects, usually searching in flea markets, and combines unusual items such as photographs, postcards, branches, chandelier drops, boudoir dolls, vintage place mats and luscious fabric and feathers. 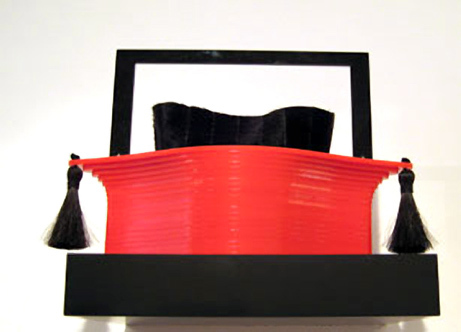 Her works are combinations of digital technology and traditional methods like laser and water jet cutting and handmade horsehair tassels. Hard and soft materials -acrylic and feathers are put together. In her handbags she allows viewing the inside and outside of the bag simultaneously. Combining the mundane practical side of a bag that has to carry keys, phone, lipstick and other things and also be an art object. 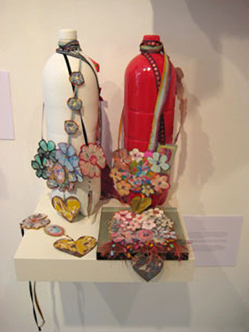 Both her bustiers and handbags are beautiful works of art, almost surreal in their extraordinary combination of disparate elements, transforming them into exquisite objects d'art. Jane Goodwin trained at University of Brighton, M.A.Fine Art and at Surrey Institute of Art and Design, B.A. ( Hons) Fine Art. Before commencing a fine art education Jane worked in publishing and advertising. 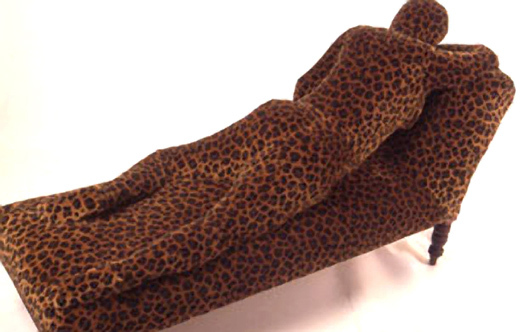 Her soft furniture sculptures have a surreal quality in which their powerful simplicity results in clarity and boldness. The White Suit sculptures developed after earlier training as a fashion designer. Each animated sculpture is individually made. Her art is orientated towards investigating, highlighting and echoing the multi-faceted reality and shenanigans of 'Life in the City'. A conceptual artist armed with sharp wit, concise snappy puns and dry humour, she mirrors the suave yet bitter intellectual settings and mental overdrive of business practice. Jude Tucker completed a BA (Fine Art at Cheltenham College of Art and a Post Graduate Diploma in stone carving at City and Guilds of London Art College. She is the first woman to have been commissioned to carve grotesques for St George's Chapel, Windsor. 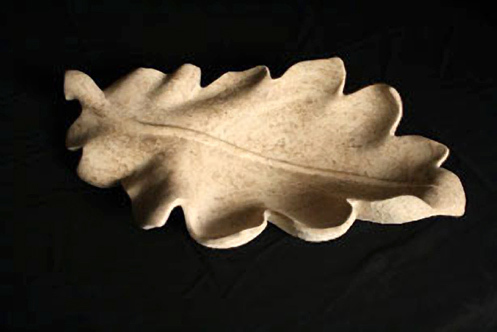 Jude Tucker's graceful sculptures and carvings in stone depict a series of common flowers, trees and seeds. The ephemeral delicacy of her subject is underlined by its translation into an immutable form. Time is halted - a moment preserved - in the sensitively rendered works. Using a variety of different stones Jude Tucker presents a series of sometimes intricate works which celebrate natural beauty and form. 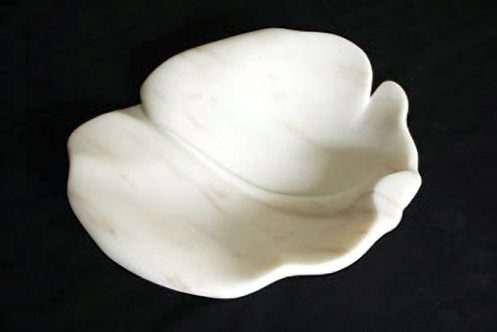 For ADO Jude has carved exquisite petal and leaf vessels using marble and British limestones. Kazuhito Takadoi studied at the Agricultural and Horticultural School at Sapporo in Japan. He moved to the UK in 1995 where he attended the Royal Horticultural Society at Wisley. In 1997 he did a one year training programme at Longwood Gardens, Pennsylvania. He returned to the UK where he trained in Art and Garden Design at Leeds Metropolitan University. His art is created from natural materials. He marvels at the shades in Nature and at the constant changes throughout the year. He is fascinated by shadows, from the deepest black in midsummer to pale silver grey in the weak winter sun. By using materials provided by Nature, his art slowly changes colour and by being viewed from different angles and in different lights it provides a new perspective. 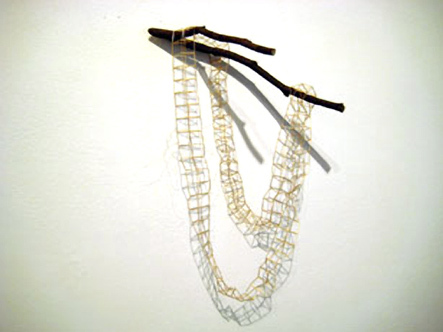 Kazuhito's delicate and ethereal necklace woven from grass that he grew in his back garden evoke sculptures. Jon Hurley was educated at Edinburgh University, Wimbledon College of Art where he specialized in sculpture and at Eton College. At Eton he studied ceramics and sculpture under Gordon Baldwin and won a number of ceramic and art prizes culminating in the 1994 Drawing Masters Prize. 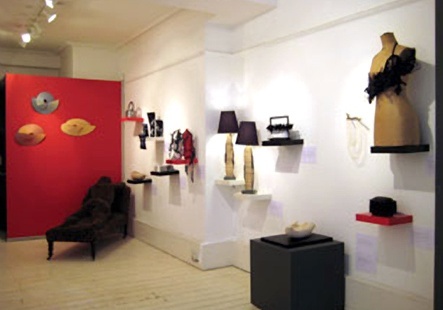 Jon's sculptural works are usually wall mounted pieces incorporating ceramics and fabric. The juxtaposition of the cold, hard, uncoloured ceramic and the warm, soft, often colourful fabric set up the major aesthetic and philosophical concerns of the pieces. 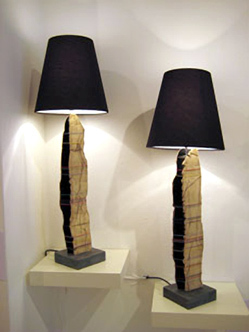 For ADO Jon has created unique organic lamps and platters which combine colored threads and ceramic. Maria Martha Pichel studied art, graphic and stage design and advertising in Argentina where she trained in painting with very renowned artists. Since 1993 she has worked and lived both in Berlin and Argentina. Her figurative paintings depict tango dancers for which her hometown is famous. Her characters convey an expressionist style that evokes cabaret and night life scenes of works by Otto Dix and Max Beckmann. Smoke, drink, loneliness and seediness surround these desolate figures. 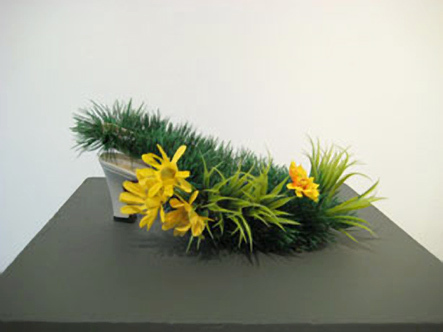 For ADO, Maria Martha has created fun, eccentric and fresh shoes with grass and flowers that put spring in our step. Cats, faces, bathers and a dragonfly adorn her unconventional wrist watches. Mercedes Castro Corbat trained in Painting and Drawing at the Prilidiano Pueyrredon School of Art and in History of Art at the School of Philosophy and Literature in Buenos Aires, Argentina. She moved to the UK where she attended the Kent Institute of Art and Design where she started to make three dimensional works in wood. She moved to the USA where she studied Arts Administration at the University of New York focusing on non governmental institutions. Her work covers a wide variety of media: paintings, collages, three dimensional works in wood and prints, using most times found objects and giving them new life. She extensively worked with charities teaching art to destitute children. Her Garland necklaces are cut out bicycle inner tubes. Mercedes uses scissors as her pencils, drawing while cutting, making all sort of flowers, fruits, leaves which flow intertwined like an endless garland. 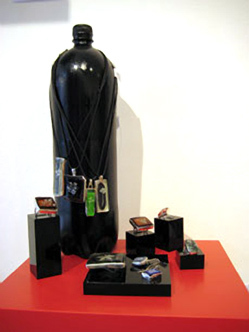 Her Protective Watch Houses amulet necklaces and broaches deal with the current issues of safety in Argentina. The Amulets, protective medals that represent a deity or a saint, here are replaced by the watch houses that now are part of the reality in Argentinean cities. 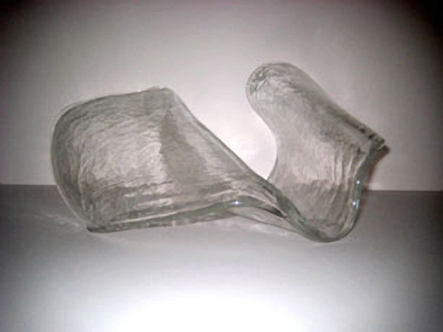 Marina Btesh is has been working in Buenos Aires with textiles and found objects such as glass and cobblestones. She trained in ceramics and glass blowing in New York. She has led an art work shop for children for many years. Her use of very thin, lurex thread has the delicacy of pencil drawings. 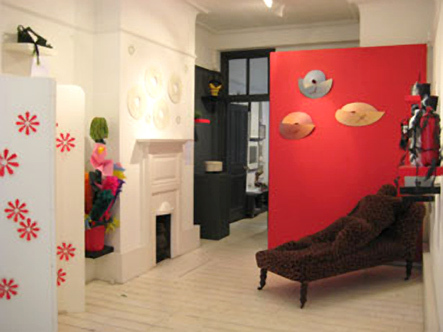 She has participated in various Textile Art Biennales. For ADO she is presenting a series of jewellery made from found coloured bottle glass and plants and leaves found in between street cobblestones and parks of the city of Buenos Aires.